After Costa Rica blew our minds in 2012, we thought it would make an ideal venue for a fieldcourse. Then the opportunity arose this year to put together exactly that, and so I headed back to the rainforest in July to check out a range of locations that we'll now be taking students to every January. The trip proved a cracker, with quite a few new mammal species for me, including the amazing Spix's disc winged bat, central American woolly opossum, tayra, and a life-experience find of puma while spotlighting on foot. The fieldcourse is going to be awesome. I started my trip at Osa Conservation's beautiful Piro Research Centre on the Osa peninsula. Corcovado National Park had been the highlight of our previous trip (approaching from the west, via Drake bay) and so I was keen to return to the Osa, but this time to approach from the east and check out a potential fieldcourse basecamp. Piro proved an incredibly rich place, with some beautiful forest and great mammal, herp and bird life throughout its diverse habitats. Thanks in particular to Manuel Mendoza for showing me some of his favourite spots, and Golfo dulce poison frog (the Osa's awesome little endemic), and to Juan Carlos Cruz Díaz for all the camera trapping and mammal chats. All four primates (spider, howler, squirrel & capuchin monkeys) and agouti are easily seen in the forest surrounding Piro, and puma, tayra and ocelot are all regulars on their camera traps. With some great local knowledge I quickly got my SLR trap set up on a puma scrape, before exploring the area. Walks in the forest and a little spotlighting on the river yielded some great frogs, helmeted basilisk, armadillo and proboscis, nectar-feeding & common tent-making bats. I then walked in to Corcovado National Park along the coast, from Carate to Sirena station. I didn't have time to stay on at Sirena, and so walked in and out on successive days (a 36km round trip). Some great sightings along the way included a dozing tapir, green & black and gulfo dulce poison frogs, a confiding Northern tamandua, a couple of slug-eater snakes, common tent-making and white-lined bats, howlers, capuchins, red brocket deer and a long-dead humpback whale! Wading the Rio Claro river was easier than it can be, as we hurried along to catch it before the rising tide swamped the river mouth. No sign of bull sharks or crocs. Nice. The highlight of the Sirena station area was my first ever cordiceps fungus - sprouting out the back of a carpenter ant's head. My guide had been tracking its growth for the past two months! We had a great night, chatting on the porch and scanning for eyes, and I bumped into Nito - a naturalist guide who I'd met in the Amazon six years before. It was he who had convinced us, while we were busy watching night monkeys, to head to Costa Rica one day. We set out for the Sirena river before dawn in the hope of catching the bull sharks. The tide was too high to access the river, but we had great views of striped owl, and super-fresh ocelot and tapir tracks, crisp in the sand after the night's rain. Soon we were back on the return trail to Carate, putting our energy into hunting for puma. A female had been seen several times in the area and currently had cubs. We found fresh tracks and a troop of spider monkeys were going crazy above our heads, so we split up and scoured the undergrowth. But the noise eventually died down and we had a long way to go, so we moved on. It turned out that we were in the right place at just the wrong time; apparently she popped out on to the trail just two minutes behind us. The heavens then opened in a spectacular way and we spent the next few hours marching in truly torrential rain. We passed soaked coatis, tamanduas, howlers and spider monkeys, but were warmed up by an awesome pair of tiny spix's disc-winged bats, hanging by their wing-suckers from the inside of a furled banana leaf. I was stoked - I'd been wanting to see them for years! I returned to Piro for the night before heading out to Puerto Jimenez for my flight up to San Jose. With puma-hope still in my heart I went out to collect my camera trap, but nothing exciting had been through. A few weeks later Juan Carlos sent me these images from one of his nearby trail cameras, of a margay approaching my SLR trap (note one of my flashes in the centre of the image) to within a few inches of the trigger point before veering abruptly off the trail. Aaaargh! Next time. I met up with good friend and co-leader on the fieldcourse Andy McGowan in San Jose and we headed up to La Selva Biological Station to work the trails and consider the options. It was great to be back - La Selva is a stunning place with an excellent trail system and great facilities. The whole region was experiencing severe flooding, so we had to travel in to the reserve by boat. We spent every waking hour on the trails, with some great birds (smart woodpeckers, several manakin species, snowy cotinga and a sun bittern on a nest), some nice herps, including green & black and strawberry poison frogs, and some cool mammals: three-toed sloth, nine-banded armadillo, greater sac-winged and proboscis bats and a stunning tayra - fantastic! The highlight of the trip came on the second day. A puma had been seen briefly in the morning, so we headed out immediately and found tracks but no cat. We spent the entire afternoon and early evening exploring the area and returned after dark, spotlight in hand. The retreating flood waters had left a thin film of alluvium over the forest floor; ideal for tracking. And after an hour of spotlighting we picked up super-fresh tracks and as I rounded a bend by the main bridge she came right out in front of me, walked briefly down the path towards me and settled off the path in some bamboo scrub. It was electrifying - just the three of us in the dark. One of the most thrilling encounters I've had in the wild. We managed to watch her and share her with passing visitors and researchers for a good hour. Magic. The next morning we moved on west to Tirimbina for the night, to take a good look at the Robert Hunter field station, explore the trail network and plan a range of field exercises. Thanks to our guide Willy for some great herp gen, and for being the first person I've met that has ever seen a yapok. Apparently most mammalogists look pretty miffed when they hear that he's seen one - Ha! Yapok (water oppossum) are incredible looking things, and one of my top five must-see mammals. It was seen in the stream near the field station, so you never know - we'll be back in January! Spotlighting in the rain around the arboretum at the main lodge yielded woolly opposum, Central American woolly opposum (my first) and nine-banded armadillo. Great place! The next day we hit the road for the long drive up to Monteverde to plan the cloud forest part of the course. Highlights included the altitudinal gradient from the Monteverde Biological Station up to the continental divide, tickling a monster tarantula out of its burrow in Bajo del Tigre and finding long-tailed manakins in precisely the same place that we saw them three years ago. Watching three-wattled bell birds and resplendant quetzals in the same tree while drinking the best coffee I've ever had was also pretty killer; Monteverde coffee center - go there. It was also great to hear that cats are making a comeback in the area, with puma, ocelot, jaguarundi, margay and even oncilla all gracing camera traps on the local trails. Gripped by the prospect I set up my SLR trap on a proven trail for our last couple of nights, but sadly nothing came through - but I'll be back with my trap every January, so something will eventually come of this! The mammal highlights came from a couple of nights at the gate to the cloud forest reserve. Having sat at the hummingbird feeders for olingo on our last trip, I knew it was a great spot for nectar-feeding bats, so I took up some cold pizza (for me) and an IR trigger rig to see if I could get some pics. Among the many failures were a couple of gems that paid off for the battle with the rain. Note the pollen cap on the lower left bat below; clearly he'd already been busy with the flowers in the forest. I had planned to spotlight the road after finishing with the bats, but a downpour rolled in. So I returned the next night and spotlit all the way down from the main gate to the first street light, hoping for kinkajou or olingo. In the end I had great views of both, standing in the silence on my own. The olingo responded well to a bit of squeaking, coming right down to eye level. A brilliant night. We then headed to playa grande on the Pacific coast, with a view to ultimately using it as a venue for a marine conservation focus; critically endangered Pacific leatherbacks nest in this area at that time of year. So we spent our last couple of days checking out the mangroves and spotlighting the dry forest. All in all, a brilliant trip. I can't wait to return, year on year, to share this place with our students. The Carpathians had long been on our radar, with the promise of a step back in time, beautiful wild country, and some great natural history in and around Europe's largest tracts of old-growth forest. That they also hold Europe's largest populations of brown bear, wolf and lynx only added to the appeal. 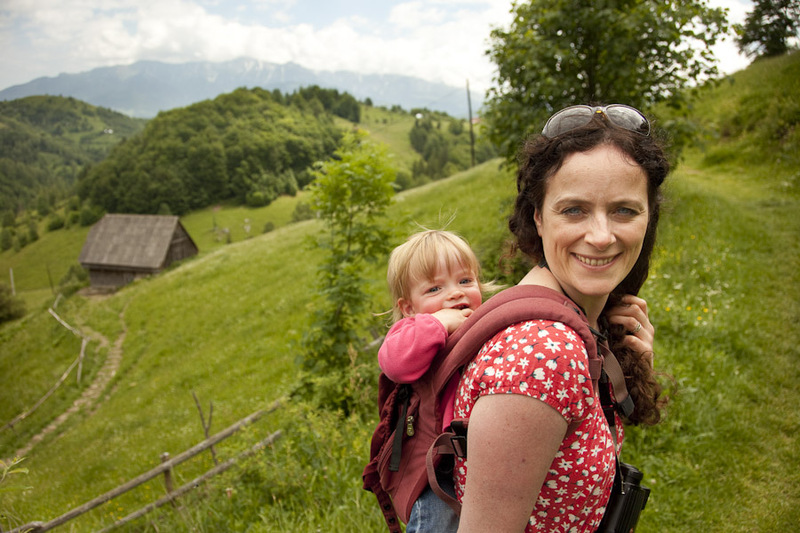 So in early June we packed up the twins, field guides and optics and headed to Romania with good friends to spend a week exploring the Piatra Craiului and Bucegi massifs. Our first day in the field started well, with bear tracks at 05:30 and a distant brown bear through the scope soon afterwards, moving off the right-hand peak in the image above. The day ended with European beaver and yellow-bellied toad by a lowland river. While the mammals were fairly thin on the ground throughout, early mornings spent scanning from a peaceful vantage were a wonderful way to start the day. European beaver have been reintroduced to a few sites in the area and are leaving some pretty obvious signs of their return to the forest! We had good views one evening of an adult and kit. On our last day in the forest we took a long walk up the Dambovicioara valley that cuts in to the Piatra Craiului from the south, in the hope of finding a new vantage point for scanning the peaks to the west. The going was quite tough with the girls on our backs and the valley was deeper than we had expected, with thick beech forest and then pine rising steeply from the track edges and obscuring the high clearings that we were hoping to scan. But luck turned our way towards the top of the path when I stopped for a breather and my eyes drifted in to the forest landing square on the face of a Ural owl sitting quietly about 10m away. A striking and elusive bird, the picture does it no justice - as we were carrying the girls I had only my phone and the scope with just a shoulder to rest it on! All in all we saw 11 mammal species between us: brown bear, stone marten, red fox, red deer, roe deer, alpine chamois, wild boar, forest dormouse, European beaver, hare, and one of the mouse-eared bats. A great place.